Clevedon, UK – Sports fans are getting ready for the world's ultimate football event, and Roland DG is flying the flag for England at its Creative Centre in Clevedon. 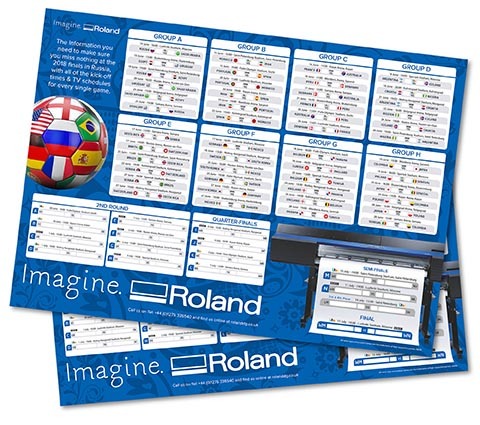 On June 26th, join the Roland team for a day of World Cup-themed footie fun and some incredibly innovative printing. Things will kick off in the Creative Centre from 10am, where visitors will be able to see Roland’s league-topping print solutions in action. There’ll also be plenty of giveaways on offer, with official footballs and England shirts up for grabs. As if that wasn’t enough, visitors will have the chance to customise their new shirts using the Roland TrueVIS wide format printers. Meanwhile, they’ll also be able to get answers to any questions they have about the TrueVIS range and wide format printing in general, with demonstrations and Q&A sessions throughout the day. Aside from all the footie fun, the VersaUV S-Series printer is expected to be the star of the show. The new S-Series is available in flatbed and belt configurations and is already being used to create everything from packaging prototypes to printed flight cases. With 200mm of vertical space, there’s practically no limit to the range of objects that can be customised. The team at Roland DG openly invite visitors to a ‘What Can You Print?’ challenge to demonstrate the versatility of the solution. Even if they don’t bring their own test objects, print pros can still become soccer stars by printing their own pocket-sized toy figurine in their favourite team's colours. In the true competitive spirit of the World Cup, visitors will also have the chance to compete in a table football competition, with the winner walking away with an official England shirt and the runner-up winning an official World Cup football. There are more freebies on offer: anyone who orders a Roland CAMM-1 GR-540 or Roland GR-640 will receive free mini fridge, ready-stocked with beer. However, this offer is only live while England remain in the World Cup so fingers crossed for no penalty shoot-outs! Running until 8pm, the event will also include lunchtime refreshments and the day's matches streamed live on the Creative Centre's screens. With plenty to inspire visitors to get printing, Academy and Creative Centre Manager Joe Wigzell will be running a Learn with Joe clinic. Visitors should come prepared with questions and queries for Roland DG's resident expert to answer. Elsewhere, Alex Liggett from The Vinyl Guys will be on hand to share his tips and tricks for running a successful print business, while Paul Butler from Fatree5 will be running fabric decoration demonstrations on the Roland Texart RT-640 dye-sublimation printer. As Roland users themselves, Alex and Paul know these applications inside out and will be sharing their expertise and experience. Roland DG UK's World Cup event will take place on Tuesday June 26th, 2018 at the Creative Centre in Clevedon between 10am and 8pm. For more information or to book a place, please visit: https://www.rolanddg.co.uk/sites/roland-dg-creative-centre-open-day.